The right storage equipment and work stations will keep food safe and secure. From stainless steel worktables and security shelving, to ingredient bins and holding cabinets, racks and carts, be sure to equip your kitchen with everything you need. Save time and money by keeping canned goods safe, accessible, and organized with a convenient can rack. A chaotic pantry can cause wasted time as staff searches for what they need, it can also lead to food waste if cans are damaged. Keep your kitchen tidy with a stationary, mobile, or countertop can rack. For storing bulk dry goods like rice, flour, and sugar, an ingredient bin is the ideal solution. Smaller bins can be placed on prep tables or undershelves, while larger bins with caster can easily be moved to where they are needed. Clear lids help you identify contents, and don't forget to scoop for sanitary portioning. Caterers rely on quality insulated and heated food pan carriers. Designed with thick walls and latching doors to hold food temperatures and reduce heat loss during transit. You'll have complete confidence in your food service whether you need a small unit that can be carried, or a larger one with casters. Safely and easily transport hundreds of pounds of ice with a mobile ice bin. Serve cold drinks anywhere with a convenient reliable portable ice bin. Perfect for outdoor events, these units feature thick insulation and durable construction, to keep ice cold for hours, and last for years. Protect valuable items from loss or theft with a reliable security unit. Wire cabinets are available with locking doors, casters, and shelving options. These durable security units come in a variety of configurations and finishes, so you can get just what you need. 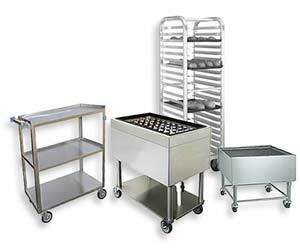 Whether Plastic or Stainless Steel, a utility cart makes it easy to transport items in a busy kitchen or grocery store. Available with 2 or 3 shelves, these units are ideal for hauling bus boxes, cleaning supplies, or service ware.